I had the pleasure of taking baby portraits today. My lil' subject Jack was adorable. He hung on for a good hour or so before it was time to nap after the photo shoot. What an amazing family. I look forward to taking more pictures of them and baby Jack. 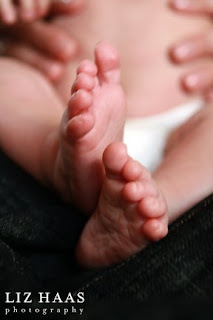 Out of respect for mom, dad and baby Jack, I uploaded a picture of feet and fingers.